Sometimes there is enough swirling about in the head and the heart that the only way to make sense of it is to write it all down and see what comes out. And sometimes there aren’t really words to express what is brewing in there. 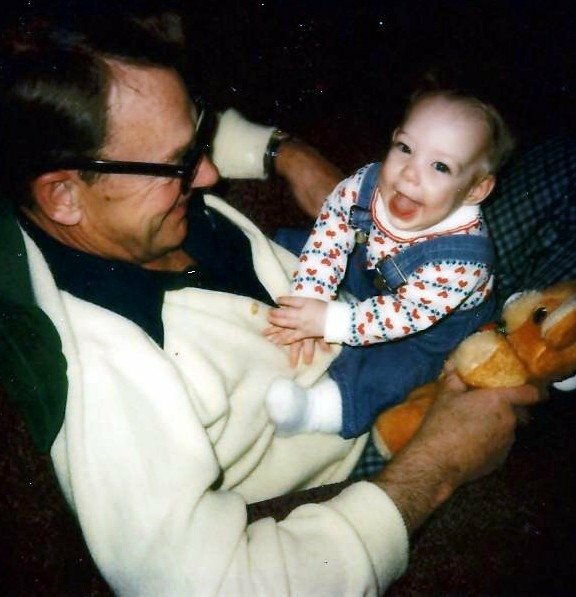 In 1976 I sat on my grandfather’s lap. 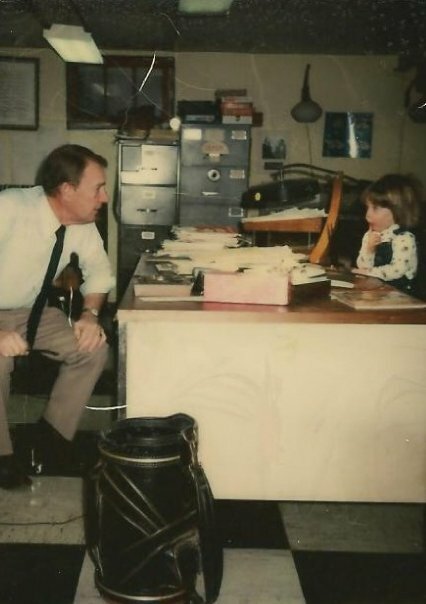 In ’79, maybe ’80 I liked to sit in his office that smelled like maraschino cherries and paper. Somewhere around 1982 I fully understood we were not allowed to sit in his car unless we had washed our hands. It was 1987 before I knew for sure he could not rub a penny in to his forearm and pull a dime out of my ear. But only 1985 when I figured out how to make the “butterfly” fly away and come back again. Pop-Pop took a spill recently, not the first of them, and I daresay if he can get himself up and at it again it will not be the last. But as I rounded the corner at the nursing home to see him on his exercise bike I smiled. He had an orange exercise bike in his basement office on Long Island. It was the first exercise bike I had ever seen. I tried to keep that smile on my face as I got the words out of my mouth “Pop-Pop, it’s Kelly…” not knowing if he’d recognize me. He smiled at me. And at first I thought I’d made it up that he looked a little exasperated with me for introducing myself. But over the remainder of my visit he smirked when Mom told him I was pregnant, and “having a baby.” As if to suggest that “of course I was pregnant with a BABY, Sherlock.” He comes and goes, in and out. Tired. But in the moments that he is 100% there he is exactly the grandfather I had my whole life. He responds to everything you say with a sly smile and a joke that makes you laugh even if you’re not positive it was not at your expense. I wanted two things out of visiting him. I wanted him to know that we were there and for him to meet Em. And I wanted Em to meet him. She dutifully showed him his own butterfly trick. The magic trick he had taught me. Although he had the resolve to wait until I’d figured out how he did it for the most part before he showed me. He knew we were there. We were leaving and he looked at Emily with those blue eyes that are as blue today as they have ever been and kinda snarled at her and laughed and suggested that she put her “dukes up” and I laughed and said “Oh, now he wants to pick a fight with you, while we are leaving, Em!” He smiled again before he closed his eyes and drifted back to wherever he goes when right now is too tiring, too painful, too… right now. But before he closed his eyes she giggled. And I knew she got to really meet him. In the middle of our trip we did the only thing that makes sense to do. I am sure I am not alone in the opinion that a nursing home can feel like one of the most difficult, most challenging… saddest places on earth. So where do you go to balance things out? Disney World, of course. There was a moment during a show in front of Cinderella’s Castle that I turned to look at Emily. I snapped a quick picture and I wish I had gotten one of myself. I think I looked roughly the same. Only I had big, fat tears rolling down my face. Cinderella, Sleeping Beauty and Belle, spinning around the stage singing “Dreams really do come true…” it was too much for this sappy girl. I haven’t written much about MQD’s and my wedding or about the overwhelming sense of joy I feel every time I am reminded that I am pregnant. There just really aren’t any words. Emily’s face in this moment… like she is looking at something that is absolutely 100 % everything she dreamed it would be. That’s how I feel every morning lately. This entry was posted in Family, Parenting and tagged Aging, Grandfather, Parenting. Bookmark the permalink. You know just how to say it, Kel. I have the last picture of me and Dad, the one you took at Palm Garden (why do they insist on naming these places like vacation spots, because they are definitely not, not for those who reside there or those who visit), the one where Dad is barely there and I am leaning on his shoulder wishing he’d say, “move OVER, Ann, you’re crowding me” like he used to before he reached to tickle my knee with the strongest right hand I’ve ever known. I miss my dad and he’s still here. Yup I’m crying too (big fat tears rolling down my cheeks). Some times I am both terribly sad and terribly glad at the same moment that my grandparents died before I came along. oh man, I’m dying over here….sobbing actually….. where’s my disney styled rainbow shitting unicorns? Today seems to be the day for tears, happy & sad, lots of them. Dreams really do come true, you’re living proof. <3 It's awesome Em got to meet her Pop-Pop. Man now Im crying too! I too hope to see my great grandchildren one day! Damn girl, you know how to make a girl cry!